Stoney Run County Park in Leroy, Indiana is a beautiful park to enjoy with your family. 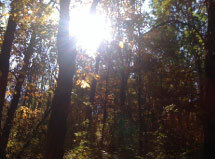 On an unbelievable 80 degree day in October, our family took to the trails. The kids were in charge of choosing the path, so we did get lost a few times. But after about an hour of wandering through the woods with hundreds of beautiful colored trees, we made it back to the playground. 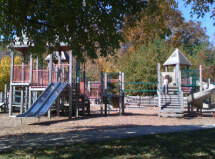 There are a number of trails through the park, including a fitness trail with a few exercise points like a balance beam and bars to climb along the way which the kids enjoyed. There&apos;s also cross country ski trails. If you have a canine friend, the park is dog-friendly as long as they are leashed. Lots of shaded park benches and picnic tables are laid out near the playground as well as shelters with barbecue grills available for events. There is also a small Vietnam Veterans Memorial which holds services on Memorial Day and the Saturday prior to Veterans Day. Come out and enjoy a peaceful walk through this serene park, let the kids wear themselves out in the playground, or relax and enjoy a picnic by the fishing lake. Learn more about Stoney Run County Park. When&apos;s your favorite time of year to wander through wooded trails?